The DIY Joint: Woodworking Gift Ideas That Are Cool And Easy! Easy And Cool Gift Ideas You Can Woodwork! The DIY Joint exists just west of New York because we believe in providing our community with the opportunity to find beauty. When we say beauty, we mean finding a creative drive deep within us, that many of us have fallen out of touch with, for a variety of reasons. We have a core need to create with our hands, and our woodworking classes for all skillsets and do-it-yourself workshops exist in direct response to that drive. You may be like our founder, Priscilla Van Houten, who has found that this medium of tangible, artistic expression can not only fill a deep, human need, but also provide you with feelings of accomplishment, completion, and fulfillment. At The DIY Joint, we aim to provide a platform of self-expression and discovery. We do this by providing a variety of woodworking classes, from simple wood projects to learning to make furniture! Our classes range in focus: plant stands, cutting boards, picture frames, using common power tools, and open studio certification. This summer we are also very excited to offer a “DIY Kids” Summer Camp, so they can be introduced to the world of joinery courses by doing simple wood projects for kids! We are simply where to learn Woodworking in New Jersey and New York! In today’s post, we are going to give our readers some gift ideas related to joinery and woodworking. We will take a look at gifts that you can make if you have woodworking experience, but some fun gifts for woodworking beginners as well. Or, if you are shopping for gift ideas for yourself (a very fulfilling practice), perhaps these ideas will help inspire you to make yourself a gift! We are confident the latter will be much more rewarding than the former. Regardless, read on if you are interested in woodworking gift ideas! Let’s start with something a little outside the box! Although this gift idea definitely takes some knowledge of basic woodworking, it’s fantastic. All you need to do is grab ¾ Square Dowel to make your cube. 25 feet should be enough. Cut the dowel into four long pieces to make two squares. You will need a nail gun, unless you are very old-fashioned, which we respect. Try to make it so the edges are both the top and bottom of each square. To better visualize the project, and learn about how to hang your funky cube light, check out the full article here. For this project, you might need to go to a flea market or two in order to find the right materials to make a pallet topper for that antique desk you might have lying around in the attic. Now, for the exact specifications and dimensions of the materials you will need, you can check out Thistlewoodfarm.com, but we will get the juices flowing here. First you should remove the legs and braces from your table of choice, and then find a free pallet. You’ll want to remove the pallet boards so that you can use to them to make a frame by attaching the boards to the sides of the legs. Eventually, you will re-nail the boards onto the pallet, but this time they look beautiful! This is one that the ladies are sure to love, so listen up gentlemen, if you are smart. This is a great option for gift givers on a budget, and could hold anything from herbs to candy. When you are making the box, consider using contrasting colors of wood, to really make the box stand out. For example, using cherry for the base and walnut for the lid is quite eye-catching. A knife block is a practical and necessary item, and like any kitchen accessory it needs to fall in line with a particular aesthetic. Keep that in mind before going rogue and potentially giving a gift that clashes with the rest of the recipient’s kitchen. But this is a great gift because with a rudimentary understanding of woodworking, this project could take you less than a day. Make sure you account for the typical 15 degree angle of the block to help keep the knives out of the reach of children. The two main parts of this woodworking project are a central block core, along with two curved outer layers, which are essentially stylish stabilizers. On the surface, this isn’t your usual lathe project, making a beautiful wooden spatula is an understated way of saying you care. First, you will want to lay out the spatula’s shape, while marking a line four inches from the end, so you know how big the spatula portion of the object will be. Once you do this, make two lines for the handle, which need to be the same as the material’s thickness. Create a curve for the spatula and handle by tracing out a roll of masking tape. Next, cut the shape out on a bandsaw, and go to work! For a full description on this project, you can check it out here. This one is perfect if you have taken a few woodworking classes for beginners. It’s a great project to attempt independently, if for no other reason than very few things can go wrong. All you need is a block of wood and your own set of woodworking tools! Of course, if you are without a workspace or the requisite tools, you can always use The DIY Joint’s open studio option for yourself or a party. All you have to do is make as many rectangular shapes as you wish, and then carve a hole into the top of each to hold the candle. Then the last step is to dip half of your candle holder into paint, which creates a wonderfully minimalistic feel. Check this out to better visualize what we are describing. This gift idea is a great idea if you are looking to refine your fundamental woodworking skills by doing the same kind of cutting over and over. Practice makes perfect! Perfect as a clean, simple, and unique decoration, this woodworking project is easy and fun. All you need is hardwood (or balsa wood) which is 2 cm wide, a saw, ruler, pencil, sanding block, and your choice of acrylic paints to mix and match with. Next, it’s as simple as an arts and crafts class! Mark off your designated house shapes (your choice), cut your shapes, sand your houses down, and then paint the tops as you prefer! Check out the finished product and full instructions here. 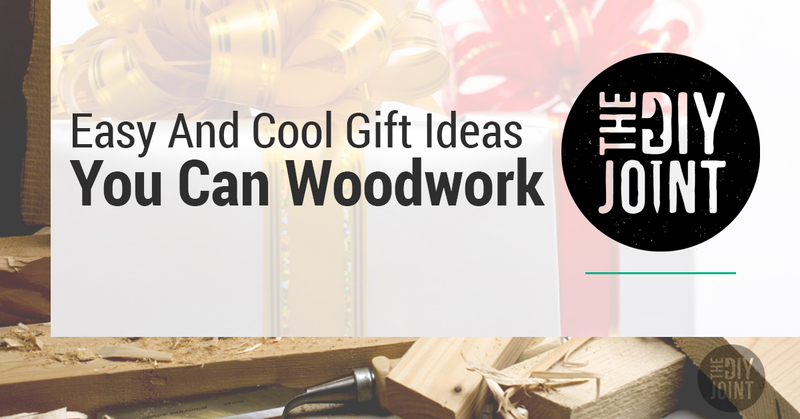 We hope that you have found these woodworking gift ideas inspiring! If you feel like they are a bit outside your comfort zone, have no fear, because that is exactly the reason we started The DIY Joint in the first place. We love teaching beginners, and remember that all experience levels are welcome. We offer great opportunities for private parts (a great birthday idea, speaking of gifts), as well as a great mix of woodworking classes and do-it-yourself workshops. If you are ready to tap into your creative side and maybe learn something new about yourself, consider The DIY Joint for our woodworking courses. Learn more about our schedules and options today!